This might be a long story. I have no experience with Goldwings. So here goes. I purchased a 1985 1100 Aspencade with high mileage 166,ooo km. The owner had bad luck with it. He purchased it about a year ago in Prince George BC for $3000 (Can) He drove it home to Chetwynd BC and it was ok. He decided to have it serviced and make sure it was roadworthy. So he took it to a dealer in Beaverton Alberta (about 3 hours drive away). They charged him $2600 to overhaul and clean and sync the carbs, overhaul the clutch and front brake master cylinders. He drove it home from there and was pleased with the performance. He then found that the bike would not idle except with the choke on. He called the dealer and they felt it was a minor adjustment maybe to resync the carbs however it would not be covered by warranty which pissed him off. Plus the three hour drive there and back. So you now you can get a feeling for distances involved here you city dwellers who can get to a dealer or mechanic in half an hour. So the bike sat since last July and the only thing he did was add fuel stabiliser over the winter. (can get down to -40 up here) So this month he decides to sell it and along I come not really looking for a goldwing but the price of $1000 tempted me too much. They are going away for one week and I said I would try and arrange a trailer by then I live 90km away in Tumbler Ridge. Now there does not seem to be any motorcycle mechanics in Chetwynd or Tumbler Ridge. I now have to hitch a ride back there. The previous owner is not too interested in helping as he notes he spent $5600 on a bike that he barely rode 500 hundred km and I can understand that. 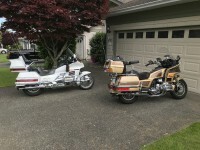 So that is my first experience with a Goldwing. You guys can let me have it if you want, but I still have hope that it is not a major fix. So please give your opinion on what you think is wrong. Thank you in anticipation. 1) carbs should not have to be "resynced" after a shop supposedly overhauled and synced them; so something does not add up there. in fact, syncing only affects idle, whereas your problem seems to be under load, so the shop is out to lunch there. 2) if it's a 1985 then it's a gl1200, not an 1100, so please clarify the year/model. good luck with your bike, i hope you stay with it, they are wonderful machines once you get things sorted out, and, depending on condition, $1000 isn't necessarily too much to pay, even though you are having issues. Congrats on your new purchase. As winguyjo mentions these are great bikes once you get them sorted out. Finding a mechanic for these older bikes is a challenge, and can be near impossible. Get the OEM service and the electrical troubleshooting manuals, supplement these with a Haynes or Clymer and a lot of your issues will be addressed. Without the manuals, you can go down the proverbial rabbit hole quite quick. Peruse the forums for information. You can probably get the answer to your questions/thoughts by doing this and not having to ask for opinions. There are some basic tools that you will need, but first get the manuals, sit down in a comfy chair with a cup of Joe, and start reading. I've been working on my '85 LTD fuel injected GW for three years, my retirement project keeping me busy and the mind engaged.